As a monumental figure in education and poetry, Mari Evans also played roles in shaping women’s history, politics, music, and drama. Born on July 16, 1923, in Toledo, Ohio, Evans’ mother passed away when Evans was ten. Her father immediately felt the need to encourage her in any way he could, cultivating her talent of writing that would later serve as her main career focus. After attending public schools in her hometown, Evans attended the University of Toledo in the 1940s where she studied fashion design but left without a degree. Her interests shifted to writing poetry and by 1969 she was a writer in residence at Indiana University-Purdue where she taught courses in African American Literature. In 1969 she published her first work Where Is All the Music? followed by her more famous I Am a Black Woman (1970). During this time Evans also worked as a producer, writer, and director of The Black Experience (1968-1973), a history documentary which aired on prime time in Indianapolis. She also worked in theatre, adapting the musical Eyes (1979) from Zora Neale Hurston’s novel Their Eyes Were Watching God as well as writing a choreopoem, River of My Song, and a one-woman theatre piece called Boochie. While embracing her love for these and other projects, Evans served as a consultant for the National Endowment for the Arts from 1969 to 1970. Evans has published two collections of her poetry, Nightstar: 1973-1978 (1981) and A Dark and Splendid Mass (1992). Evans has taught at a number of other institutions including Cornell, Northwestern, Washington University in St. Louis, Spelman College, the University of Miami at Coral Gables, and the State University of New York at Albany. But she is best known for her talent in poetry and her work has appeared in more than one hundred anthologies. Most of that work focuses on the celebration of Africa and the struggles of the Civil Rights Movement as well as other themes bringing to light the reality of the African American experience. These projects were largely influenced by close friend Langston Hughes, who pushed Evans to write with confidence. She subsequently became a well-respected figure in the Black Arts Movement of the late 1960s and early 1970s. Evans now writes children’s books that concentrate on black history and culture for the younger population. The most important of her countless awards for writing came in 1981 when she received the National Endowment for the Arts Creative Writing Award. 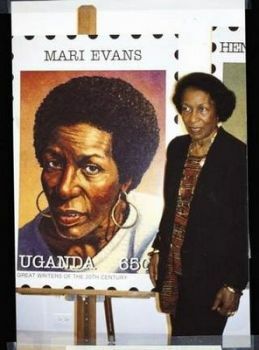 Evans’ impact on Africa was reflected in 1997 when the Ugandan government issued a commemorative postage stamp in her honor. Mari Evans is divorced with two sons and now resides in Indianapolis. Joyce Owens Pettis, African American poets: lives, works, and sources (Westport, Conn.: Greenwood Press, 2002); Kwame Anthony Appiah and Henry Louis Gates, Africana: The Encyclopedia of the African and African American Experience (New York: Basic Civitas Books, 1999); Linda E. Cullum, Contemporary American ethnic poets: lives, works, sources (Westport, Conn.: Greenwood Press, 2004).